Its been a small hiatus from the blogging world. I've been busy as a cat on a hot tin roof. Baby A has been on a cold, cough and teething spree that seems endless, have had many a sleepless night and if thats not enough, we've had to deal with "Seperation anxiety". Fast forward to the present, at 15 months Baby A will not let mommy out of his sight without breaking into a cry. Be it a short trip to the kitchen to grab him a plate of food or the more urgent calls of nature. Ive got to be in Baby A's range of surveillance. Some call it "Seperation Anxiety"....I call it "Mommy Entrapment", should I be enjoying all the attention ?? maybe I should.....who knows??.... come adolescence, it might be me suffering from Seperation Anxiety... hahaha! Walnuts: 5-6 whole chopped. a few to decorate. 1. Soak the whole dates in warm milk overnight in a covered vessel. Remove the seeds. Add sugar and grind them to a smooth paste along with the milk in which it is soaked in. Add oil and mix. Note: If using seedless dates heat milk and dates for few minutes on a stove top or nuke in a microwave to soften them. 2. Preheat the oven to 350F/ 180C. Lightly dust a 23 cms round baking tin, or line a regular tin with baking paper ( I used lighlty greased foil as I ran out of BP). Keep aside. 3. Sieve together flour and baking soda. Fold in the flour one table spoon at a time into the dates mixture. Lastly add the nuts and gently mix. 4. Pour the cake batter into the baking tin, level the mixture. 5. Place on a rack in the centre of oven and bake at 180C/ 350F for 35-40min (or till a wooden toothpick inserted into the centre of the cake comes out clean, or cake leaves the side of the tin). 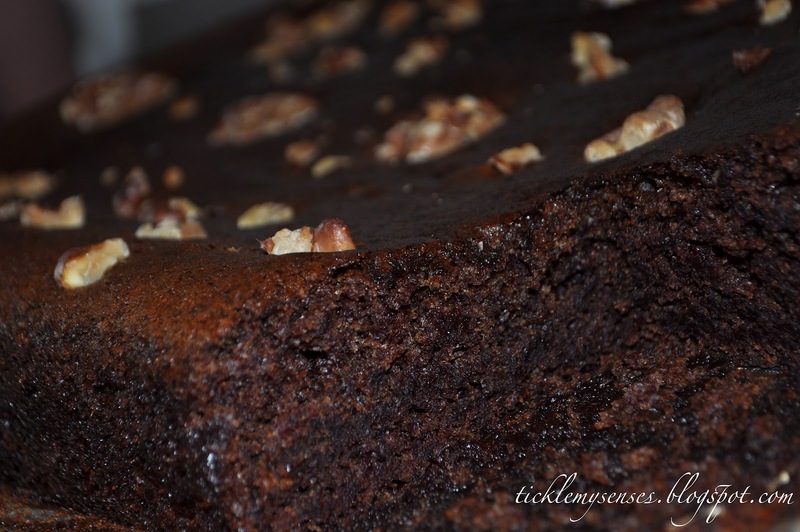 You will know when the cake is done as the aroma of the baked dates and walnuts will waft through your home and get all those tummies rumbling. 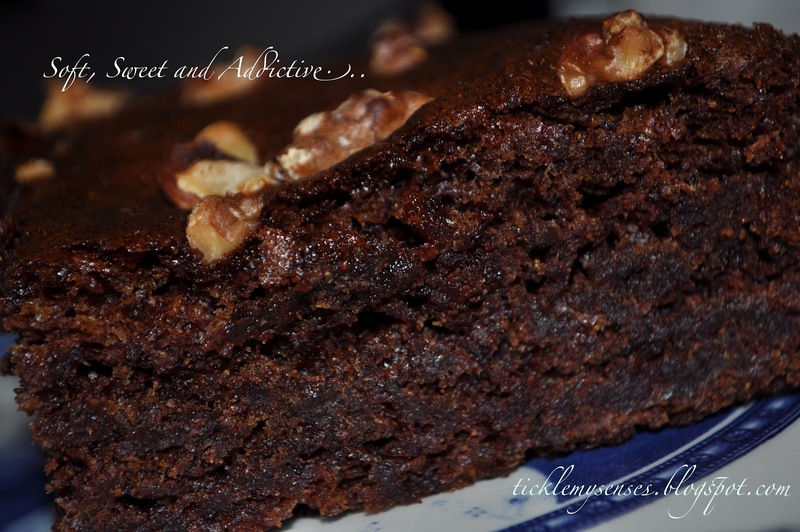 This looks really moist and yummy! Looks simply marvellous Carol! So good to see your post after ages (of my blogging break too). Hope your baby outgrows the separation anxiety soon & you have a more cheerful companion at home soon :) take care! Looks so delicious! Great pics! Hola Cay. Este bizcocho tiene una pinta que enloquece. Debe ser una delicia probarlo.